If you've ever dreamed of living in a castle with an easy commute to New York City, you're in luck. Located just over an hour north of midtown Manhattan, 249 Croton Dam Road in Ossining, New York is on the market for $3.69 million. Built in the 1920s by David Abercrombie, cofounder of Abercrombie & Fitch, the castle is dubbed "Elda Castle" after the first initials of his four children, according to New York History Blog. The castle, which has a storied past detailed on the blog, served as an oasis for the Abercrombie family after they endured the tragic deaths of two of the four children: Lucy in 1929, and David in 1937. Currently in disrepair, the buyer of the castle will have to take on a full renovation project to make it livable again. You'll have to budget more than just the $3.69 purchase price. Nearly a century old, the castle requires a full renovation. Many of the original details, such as a cast iron spiral staircase and an open patio with a fireplace, remain and can be restored. Abercrombie's wife, architect Lucy Abbott Cate, designed the 4,337 square foot castle, which has 4 bedrooms and 4.5 baths. 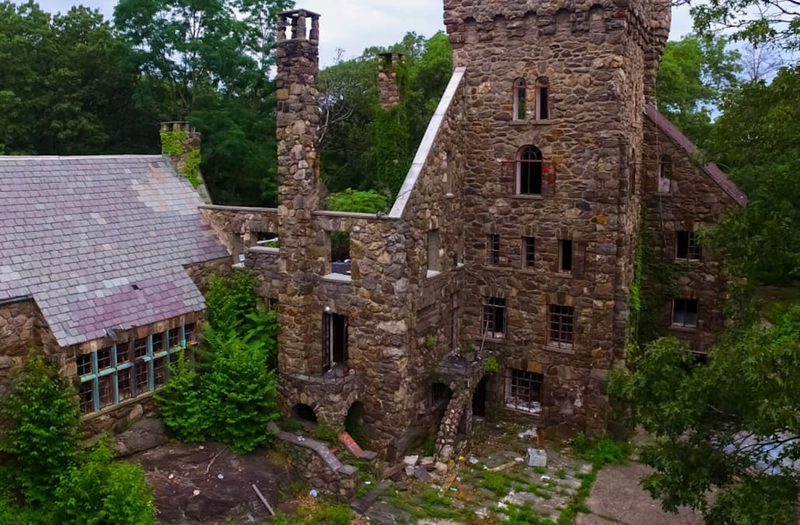 The castle includes 50 wooded acres in Ossining, New York. The acreage spans three tax lots, with an annual property tax bill of $109,701. The land can be preserved as a peaceful private escape, or possibly developed, according to Sotheby's.